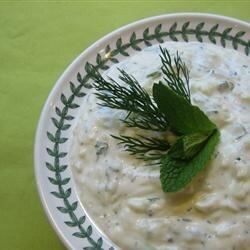 "Drain some low-fat yogurt overnight to make this yummy cucumber dressing. This is a delicious topping for grilled chicken or meat. It's also a great dip for veggies and pita chips." Line a colander with two layers of cheesecloth and place it over a medium bowl. Place the yogurt on the cheesecloth and cover the colander with plastic wrap. Allow yogurt to drain overnight. Lay grated cucumber on a plate lined with paper towel; allow to drain 1 to 2 hours. Combine the drained yogurt, cucumber, garlic, parsley, mint, lemon juice, salt, and pepper in a bowl. Refrigerate for at least 2 hours before serving. Yummy! I used Greek-style non-fat yogurt instead of messing around with straining regular yogurt (Greek-style yogurt is already strained). I thought this was just OK. Straining the yogurt gave it a better consistency. But think it had too much mint, not enough garlic and needed dill. This was AWESOME. I could have eaten it all by itself. I also like how the strained yogurt changes consistency. Really cool.